I started in Los Altos on Foothill Expressway and headed past Steven's Creek reservoir, over Mount Eden to Pierce Rd finally reaching Highway 9. The climb up Highway 9 felt slow with the extra weight on my back. From the Saratoga gap, I continued to 92 and looped back to King's Mountain, via Canada Rd. Now over 60 miles into the ride I starting to fell fagitue as I ascended King's Mountain. Once back on Skyline I started to pick up the pace. It was getting dark, so I finished the ride down Pagemill, the decent froze my legs. I warmed up again on Foothill with a couple sprints to the end. After six short weeks of training it was time for my first Double Century of the year. My expectations were in line with my training, I knew it was going to be a long day and a hot one with a forecast of 93F. The key to survival was going to be staying hydrated. In rare turn of events I had actually managed to get a good nights sleep and felt well rested for the earlier start. Adventure Corps (the race organizers) all put together a good race. We started if the customary speech wishing the racers luck and obliviously going over what not to do also. Before I knew it we were off.. The race started off in a giant pelaton but quickly started to thin out within the first 10 miles. Death Valley is an awesome place to ride, at least first thing in the morning when it is still cool. The first part of the course is a out and back to Stovepipe Wells, for the first stop. Out and back was at a good pace and now I was on the main part of the course and started a gradual climb up to Scotty's Castle. As I got near to castle, the heat was rising and it was good to get into the canyon area with a little shade. Into the canyon, began a steeper stretch of climbing, but that was better than what was coming. After reaching the other side of the canyon and the peak of the climbing I was presented with a nice downhill with a strong headwind. I thought with the placing of the stops I could use a one bottle strategy, so I've filled up at every stop. This strategy work well until this point, when I realize I was nearly out of fluid heading into a head wind on a long straight stretch to Nevada. This out back to Nevada was the toughest part of the race, I was over 100 miles in and beyond the limits of my 6 weeks of training. I could see the turnaround way off in the distance, but it didn't seem to be getting any closer. My salvation came when a group of riders came along, with some conversation and a bit of draft I was on my way again. At the turn around rest stop I filled up two bottles, so I could properly re-hydrate. With the wind at back I start-off well, 30mins later I was slowing down again with more doubts. 90F was not feeling good, but the canyon was back in site and there would be a descent towards Scotty's Castle, which was the lunch stop. After took a couple pictures I carried on up the uphill and soon enough it was lunch time and I was ready for a break. Lunch rejuvenated me and I was back on the road with one more detour, the crater. A bumpy road to get there, but definately worth the trip. A stopped a the crater brielfy for a picture and then continued back. Rolling hills then reaching second last rest stop just before the last big climb of the ride, totaling around 2000ft. I took the climb in my stride and ended-up passing a couple of people on the way up. By the time I reached the top the sun had faded away and I had to start my descent into the darkness. I had a couple headlights but they weren't up to the task of a high speed descent. I was straining eyes to see the best I could, following the yellow line in the middle of the road so not to stray off the edge of the road. Now safely at the bottom of the climb I was energized to pull in the last 10 miles. 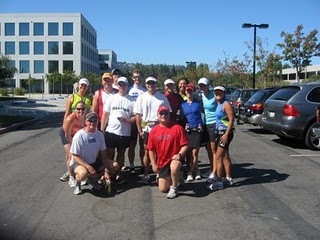 The rest of the team were in taper and were doing a short ride, followed by a short run. 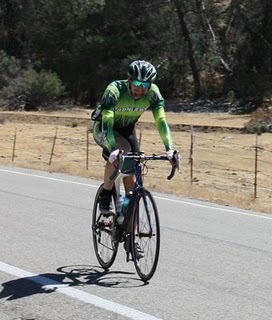 We started off at Edgewood and Canada Rd (definately a favorite starting point for the team) and headed through Portola Valley to towards Page Mill Road, team route had him turning back part the way up. Naturally I had other plans, I was going to the top with the aim of looping back via Skyline and 92. 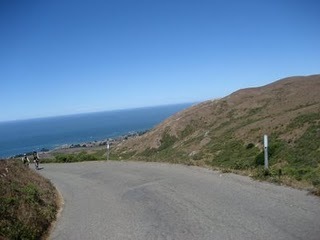 It is funny how I always seem to forget much climbing there is left to do even after I have reached Skyline Rd. One of Skyline Rd's peak is at the top of Page Mill, but much of the gain is lost you dip down at 84 with climb picking up again towards King's Mountain.